Mahinda Rajapakse, then President of Sri Lanka, held Presidential elections prematurely on January 8. 2015, thinking that he would win a third term. Instead, Maithripala Sirisena, then General Secretary of the SLFP, contested as the ‘common candidate’ under the Hansa symbol and won. Sirisena won with 6,217,162 votes (51.28%). Rajapakse got 5,768,090 (47.58%). The election had a high voter turnout of 81.52 %. It was declared a ’clean‘ election. Sirisena and Rajapakse ran neck and neck in the ‘Sinhala’ electoral districts. In KALUTARA electoral district, it was Rajapakse 395,890 Sirisena 349, 404 votes. In GALLE, Rajapakse 377,125 votes, Sirisena 293,994. In MATARA Rajapakse 297,823, Sirisena 212,435 and in POLONNARUWA where Sirisena came from, Rajapakse got 297,823 votes, Sirisena 212,435. ATTANAGALLA, a Bandaranaike stronghold went to Rajapakse. But in the Tamil and Muslim areas it was different. JAFFNA gave Sirisena 253,574 votes and Rajapakse 74,454. TRINCOMALEE gave Sirisena 140,338 and Rajapakse 52,111. 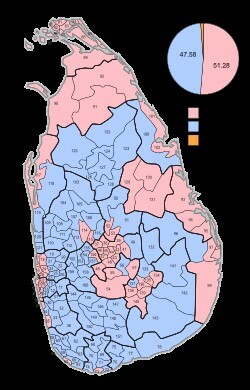 BATTICALOA gave Sirisena 209, 422 and Rajapakse 41,631. Sirisena won on the UNP vote and that of the ‘minorities’, the Tamils and Muslims. He polled around 75% of the Tamil and Muslim votes, 65% of the Christian votes and around 65% to 80% of the vote in the large urban centers. Since Sirisena won only 6 of 16 major districts, apart from the North, East and Nuwara Eliya districts, it was not considered a magnificent win. Outside the north and east Rajapakse was still ahead of Sirisena. It was the North-east votes that decided the matter. ‘Is that a feasible model for forming a government in this country?’ some voters asked. Sirisena’s win, based on the votes of the Tamils and Muslims, was a great shock to the Sinhala voter who saw for the first time the impact of a bloc Tamil vote and a bloc Muslim vote. Then they saw that Sirisena had won because the Sinhala voter had also supported him. That was an even greater shock. A Sinhala trishaw driver told me ‘We added the figures and we realized that it is we who gave this victory’, he said, ‘meka apine kele’. He had planned to vote for Rajapakse but when he was going back home at the end of the day, he found that his route was blocked by an election stall erected on the orders of Basil Rajapakse. He had to take a roundabout route home, so he voted for Sirisena the next day. The official declaration of the election result was shown on television. This ceremony is usually a relaxed event, with smiles on the faces of the winning group. But in this case those who assembled to hear the official declaration were tense, silent and stony faced. They stayed tense even as they walked out. There was no rejoicing in the streets the day after either. Usually when power changed hands, the streets all over the country would be full of rejoicing party supporters. Instead the public was stunned and silent. When they could at last speak, they said that this was like the 1815 coup, where the people were fooled into accepting British rule. This was ‘regime change’. Ashok Mehta writing in the Hindu” said election preparations had begun 18 months earlier in London. The three persons who worked towards this regime change, he said, were past President Chandrika Kumaratunga, former Prime Minister Ranil Wickremasinghe and Mangala Samaraweera. A very different person to Sarath Fonseka was selected as the Presidential candidate, the pleasant, likeable Maithripala Sirisena. Maithripala Sirisena was brought in, only in the last two months, but the ground work was prepared months earlier, when Sirisena was invited and felicitated in the USA and given a special award for his work for health in Sri Lanka. President Sirisena stated on television that he had signed an agreement together with 49 other organizations, (‘like minded political parties and groups’), to take the country on the correct path. Certain promises seem to have been made to the Tamil National Alliance. Sumanthiran and Wigneswaran have spoken of the promises give to them by the Yahapalana government. The west studied Sri Lanka carefully and decided on two election issues, the high cost of living and rampant corruption. There were a multitude of irritants and unfulfilled aspirations among the people. Since they knew that they could not defeat the Rajapakse government though democratic means, they organised protest meetings to discredit the government. They said that the Rajapakse government was corrupt to the core. Most of its leaders had abused power and were getting away with all sorts of illegal activities. However, opinion polls conducted in the five weeks prior to the election showed an overwhelming 80% of the electorate recognized the 2009 war victory and the peace it brought, as a major benefit for which Rajapakse got the credit. About 36% of the voters also gave Rajapakse credit for the mega development projects. Maithripala Sirisena won because of the hard work of several agents. Leading the pack were the NGOs active in Sri Lanka politics, called ‘civil society organizations’. These are implanted organizations, not home grown, financed by western countries, possibly the CIA, and managed by paid local agents. The term ‘civil society’ was created to incorporate them into the political life of Sri Lanka. These NGOs are paid to intervene in domestic politics, change public opinion and help to install puppet governments which would destroy the country. These NGOs were active in the 1956 and 1995 elections too, but that was nothing compared to their impact in 2015. These NGOs played a major role in the 2015 election. They focused on governance and corruption and ‘the need to address international commitments’. They created public opinion for change. They used social media very successfully. They also targeted the youth vote. The youth vote was decisive at the election. One voter, who did not vote in 2010, said the social media campaign made a huge impression on her, also the participation of youth. There was also the ‘minority vote’. This was vital. Sunday Times gave a map of the voting pattern of 2010 and 2015 presidential elections. In both maps, the north and east voted for Sarath Fonseka and then Sirisena. The Tamil vote was certain in the 2015 election, but the Muslim vote needed to be carefully manipulated. A militant organization called Bodu Bala Sena (BBS) with links to USA and Norway sprang up in 2012. Ven. Gnanasara the leader of Bodu Bala Sena was unknown to the public till then. It was alleged that BBS was working on the orders of their sponsors, Norway and USA. There were two other organizations as well, Ravana Balaya and Sinhala Ravana. The word ‘Ravana’ indicates foreign influence. The international media was also brought in. A dispute between the Sinhala and Muslim villagers of Alutgama on 15.6.2014 led to the destruction of Muslim owned business, houses and mosques. The international media frenzy which followed this Alutgama Incident’ indicated that the news offices were extraordinarily well prepared to report on this. They had prior knowledge and were ready with their copy well in advance. The sensationalized, exaggerated reports made it seem more serious than it really was. The reports suggested that the government was behind the event. The Presidential election was followed by a General Election on 17. August 2015. For the first time the UNP formed a coalition, termed United National Front, consisting of UNP, SLMC, All Ceylon Makkal congress, JHU and others. UNP knew it could not win by itself. The result of the general election 2015 was follows. United Front for Good Governance 5,098,916 votes, United Peoples Freedom Alliance 4,732664 votes. United Front got 106 seats and 45.66% of the vote. UPFA got 85 seats and 42.3% of the vote. TNA got 16 and JVP 6 seats. The results showed a formidable opposition to the UNP, an opposition composed mainly of the Sinhala Buddhist vote. Island editorial said the General election could be considered a vote of confidence in the previous Rajapakse government, which the ‘international community’, separatists and their local allies tried hard to dislodge, in a bid to install a puppet regime and create a situation which would help to break up the country. 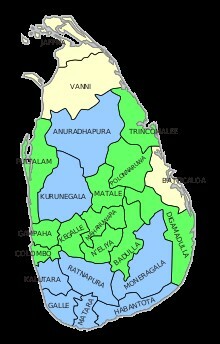 In both elections, the Yahapalana group did not get the majority of the Sinhala vote. Who declared 2015 presidential election as a clean election? One has to only check election commissioner’s HSBC account in Singapore to find out how millions of dollars was credited to it and who did so. How it happened? Another Indian job. The former President called an early election. The Indian imperialists (Indian Union) were ready to correct its mistake in 2005 when it backed Mahinda Rajapaksa over Ranil Wickramasinge. Then, Indian imperialists advised Indian block vote in the island to abstain from voting. The reason for the preference was Indian imperialists thought it will be easier to negotiate with Mahinda an unknown matter for India. When profiling Mahinda they did not take in to account his brothers, in particular Gotabaya who was in the US at that time. Unfortunately for India, Mahinda did not follow Indian directions as former Sri Lankan leaders did since 1956. In 2010 India enrolled General Sarath Fonseka as a presidential candidate against Mahinda and failed. So behind the scene as Indian imperialist always do they were planning for years and had got former governor Chandrika Bandaranayake-Kumaranatunge to do the job and succeeded with doing a repeat of what India did with her father Solomon West Ridgeway Dias Bandaranayake in 1951. India did not have to wait for four years this time. India managed to divide the non-Indian vote and got the Indian block vote for Maithripala Sirisena the new Indian governor of Sri Lanka who may be the proxy for the real governor Chandrika. What it means for the Indian Empire? It means a lot to the Indian Empire. The former partner of the British-Indian Empire from Fiji to Guyana that is all former tropical colonies of the British-Indian Empire. India lost its control over the island nation since 2005 as the new government of the island nation managed to wipe out the Indian terrorist arm; trained, armed, financed, managed and branded Tamil Tigers by India. Since the election of the new governor Indian cars and food have become cheaper with reduced tax on Indian products. Indian Imperialists have already indicated massive investments and projects in all sectors of the economy. This will not be a hard act as the island nation’s economy has been in their hands for more than two centuries and the business language in the country is an Indian language spoken by more than 75 million of them in India. The wealthiest in the island are Indian though their wealth is not stored in the island but most of it in India. Reclaiming the control over the island nation will supplement its control over the Indian Ocean and Indian Ocean countries. With its unchallenged military power; with ICBMs, Aircraft Carriers, Nuke Subs, Nuke (Peace) bombs and purchase of hundred billion dollars’ worth of military hardware the island nation provides the best step with Mauritius a third State of India to lay a drag line across the Indian Ocean. Yes. But the LEAD was only 200,000 votes!! North and east Sirisena’s LEAD was 650,000 votes!! Wimal Weerawansa was taken into custody today for misusing govt vehicles …. a laughable allegation compared to the crimes committed by the Yamapalanaya goons who even looted the nation out of billions of rupees in the GREAT CENTRAL BANK ROBBERY aka the Bond Scam. Those who LOOTED the Central Bank were rewarded with even higher positions in the govt by Ranil Wikunanasinghe and Aloysius Mahendran is busily buying up properties and investing in 6 media channels (2 news papers, 2 Radio stations and 2 TV stations) to help the UNP disseminate it’s political propaganda. While those BIG TIME CROOKS remain free, we have Wimal Weerawansa being arrested for misusing govt vehicles when he was a minister in the previous govt. After all the multivarious fake allegations they had levelled at Wimal, this is all they can arrest him for? The Yamapalanaya is a bunch of Keystone Cops making themselves the laughing stock of the nation with their COMICAL ANTICS! They should know that those who live in glass houses should not throw stones at innocent people! Wimal Weerawansa Deshapremi Mathithumata JAYAWEWA!